Hey Folks! As I've been watching film of the Michigan spread offense from this year to date, there is one specific play and/or scheme that Coach Rod and Coach McGee have been calling and the players executing that makes me go 'Wow'! Now we all know the threat that Denard Robinson brings with his legs at the dual threat quarterback position, and one play that has been working extremely well is the QB Sweep out of trips formation. 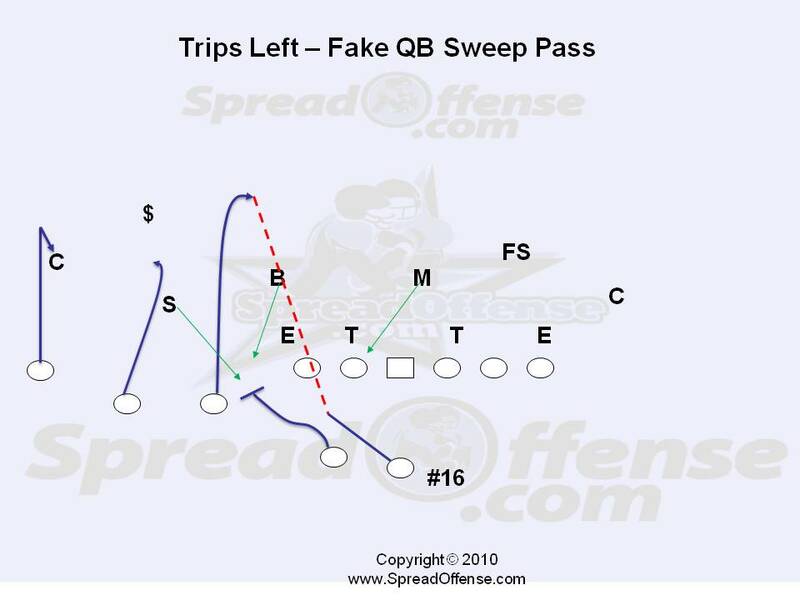 Basically this QB run play is a 'hat on hat' play where the superback (or half-back in the shot gun alongside the QB) will lead the QB on a sweep play with the rest of the offensive players executing 'on' blocks, especially on the perimeter. The interior linemen are executing outside zone and reach blocks on this play, trying to work to the outside of the 'V' of the neck of the defensive linemen and working to drive the opponent off the line of scrimmage while working to the second level linebackers once movement occurs. Here's a video showing the play I mention above, with the trips being created on this play by a tight end (TE) and two flankers (FL). You'll notice on this play the play-side offensive tackle (OT) executes a nice fold block to get to the perimeter backer with the TE blocking down. 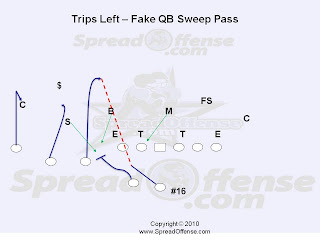 Now that we've seen a visual of the run play, lets look below at a very hard to defend counter to that play, a QB Sweep Pass. Lets take a look at this in a static play diagram below. OK, now put yourself in Notre Dame's defenses shoes on this play - you have the best dual threat quarterback in the nation coming at the perimeter of your defense with his lead back ahead of him, you're thinking QB Sweep right? Wrong! Denard pulls up and flips an easy touchdown pass to his #3 receiver out of the trips formation. Notice in the video how the Notre Dame's linebackers Sam, Buck, and Mike come flying up to defend the QB run, leaving the defense one defender short in covering the pass to the trips formation. This highlights the pressure a dual threat QB can place on a defense.